The ALS Association is the only national not-for-profit health organization dedicated solely to the fight against ALS. ALSA covers all the bases -- research, patient and community services, public education, and advocacy -- in providing help and hope to those facing the disease. We work together to accomplish our mission. 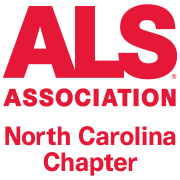 The ALS Association North Carolina Chapter focuses primarily on helping local patients and families live with ALS while the National Office focuses primarily on research and advocacy. The Chapter supports the National Office through revenue sharing and research contributions. The National Office supports the Chapters by providing up-to-date information and materials. Would you recommend The ALS Association North Carolina Chapter? I have a friend very similar to myself who is also interested in this cause. I have suggested that he looks into this opportunity.